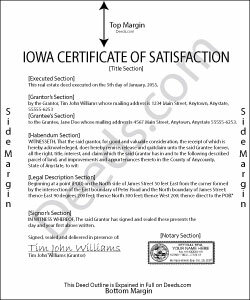 Lien claimants are required to file a certificate of satisfaction under Iowa law when an underlying lien has been paid off or otherwise fully satisfied and the owner has made written demand for its discharge. The certificate instructs the clerk of records to strike the lien from the record upon a sworn statement by the claimant that the lien should be discharged. When a mechanic's lien is satisfied by payment of the claim, the claimant must acknowledge the liens satisfaction upon the mechanic's lien book, or otherwise in writing, and, if the claimant neglects to do so for thirty (30) days after demand in writing is personally served upon the claimant, the claimant shall forfeit and pay twenty-five dollars to the owner or contractor, and be liable to any person injured to the extent of the injury. I.C. 572.23(1). If acknowledgment of satisfaction is not filed within thirty (30) of the demand in writing, the party serving the demand or causing the demand to be served may file for record with the clerk of the district court a copy of the demand with proofs of service attached and endorsed and, in case of service by publication, a personal affidavit that personal service could not be made within the State of Iowa. I.C. 572.23(2). Upon completion of the requirements for filing the certificate of satisfaction, the record of the lien's discharge will operate as a constructive notice to all parties of the due forfeiture and cancellation of the lien. Id. This article is provided for informational purposes only and should not be relied upon as a substitute for the advice from a legal professional. Please contact an Iowa attorney with any questions about discharging a satisfied lien.